Everything you need to know about "bows", cords or jump ropes including their benefits. 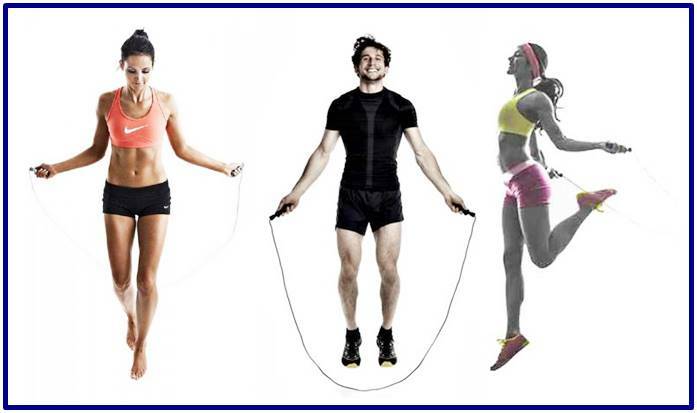 Opinions and tips to choose a good rope to jump and perform a good session of cardio with different intensities, either to tone, burn fat, improve muscular endurance, improve oxygen uptake and utilization (aerobic capacity), etc. .. benefits of performing the cardio session with a jump rope. What is it good for to workout with a jump rope? We live in a world where staying in shape is more a lifestyle and less a daily and boring routine. There are literally innumerable ways to get your daily dose of exercise every day, but very few come with the ease and enjoyment provided by jump ropes. But before To go out and buy your new jump rope, there are some things you need to know. Continue reading to see how your height influences the length of the rope you should buy ... of course I will first mention the benefits and later the types of ropes that exist. ... jumping the rope every day (or most days a week) can help you lose weight (burn fat), tone and help you grow your buttocks, legs, arms, strengthen your abs, etc ... that is, if the intensity increases (the rate of jump and therefore the speed), it is possible to obtain some degree of hypertrophy in the muscles of the mentioned body parts. If it was not obvious then you should know that jumping the rope is an excellent exercise to burn those extra calories (calories accumulated as fat) on a daily basis. This is one of the few exercises that allows you to set the pace of your workout. So if you jump at a moderate speed, you could burn about 15 calories per minute (this depends a lot on your age and physical condition) ... whereas, if you jump at a faster rate, you can burn between 30-80 calories per minute. Some experts claim that jumping rope for 10 minutes could mean the same thing as running a mile in 8 minutes ... in terms of burning calories. Do you want to improve the speed of your legs and feet? Try to jump the rope for a few minutes each day. When you jump, the tips on your feet send signals to your brain to keep you balanced. This helps you to focus even more on your feet unconsciously and brings that much-needed speed, agility and balance at every jump. This is the reason why male and female boxers love to jump rope during their workouts. Yes, running will do the same, but it puts an extra strain on your joints because each leg takes the pressure with each step or stride, plus you require a wider distance to do it or purchase a treadmill that is usually much more expensive ... Instead, jumping rope puts pressure on both legs when landing (although alternate jumps can also be made). It is a proven method that helps to increase bone density even for the elderly ... although this also depends on the nutritional part and physical condition of each person. Can you really think of a piece of exercise equipment that is cheaper than a jump rope? I really can not, or at least not being a device that allows to obtain so many advantages and benefits for the health and esthetic part. There Jumping ropes of many types and prices ... some range from $ 3 dollars and others up to $ 20 dollars or more (for the real luxury, more resistant materials) ... jump ropes are the best and more affordable way to stay in shape. Another thing. You do not need a gym bag to carry it around. No assembly is required. A disheveled rope can fit in the pocket of your pants, without any difficulty. What else do you need? Well, of course if you want strength and muscle volume you should train by lifting "heavy weights". What are the different types of jumping ropes? Depending on your skill level, age, height, jump ropes come in all shapes and sizes that deliver just what you need. Let's take a look at the variations. Usually not used for competitions, the molded rope is made of nylon cord covered segments of 1.5 inch plastic or polyurethane. Each segment is colored differently so it can be easily seen. Pearls add extra weight to help improve training. They are extremely durable and are good for recreational use and improve jumping skills. As the name describes it, this rope is all about speed. These types of strings are made of a thin vinyl cord and are best used indoors as they are not very durable (sun and rain can quickly deteriorate them). Adjusting them is as easy as just tying a knot under the handle, but because of its thinness, they easily get tangled. It is mainly used by boxers and athletes looking to enter into a powerful workout due to the speed that these type of strings/cords allow. With the leather jump rope, you get the perfect balance between pearl strings or molded strings and speed cords. It is heavier than the speed rope but slightly thicker to avoid tangles. The leather jump rope comes with comfortable wooden handles that can be adjusted to increase weight. It can be used for professional or recreational purposes. With fabric strings, you get a smooth jumping experience - as long as you're indoors (your house, gym, etc.). Due to its light weight, it can easily deform when a breeze hits an uneven surface when used outdoors. The rope itself is open to rapid wear, which makes it quite affordable (it is much more economical but its quality is lower). It is used mainly by double Dutch jumpers. Known as one of the most difficult types of jump ropes, double Dutch jump ropes are much longer than regular ropes and can range from 15 to 60 feet in length. These strings require two people to rotate two strings while a number of people jump. There are three different double types of Dutch ropes; beaded, fabric and licorice. They are jump ropes that become shorter in length than the adult ropes. The best type of jump rope for children is the type of rope that comes flanged because they do not become as tangled as the others. The rope should not be too short because it could result in multiple errors and could hurt the child. If you are buying a jump rope for the first time, there are certain factors that come into play before spending your money. Think first for what you are buying this rope - recreational or professional use? Understand weight and length factor. The material used is also a vital part in the selection of the best jump rope. So let's take a look at the three main factors. Material used: Jumping ropes can be made of nylon, plastic, cloth, leather, and even metal. For beginners, cloth and plastic are the most suitable, while the most professional can use leather and nylon. Length: This is probably the most important factor to consider before putting your money into play. The perfect length of a jump rope should be measured by placing the rope under one foot while pulling the handles to your armpits. Grips: Getting rope is also important because it could make it easier or harder, depending on what you choose. Whether wooden, sponge, rubber or absolutely nothing, the grips on a jump rope allow you to ensure that you get the best for your training. Even weighted grips to add something extra to your workout, while some have ball bearings to increase speed. How to train with a jump rope? There may be different ways you can base your workout with jumps. It all depends on your ability, your physical condition and what you want to achieve ... you can use it as a warm-up and also as a weight training recovery session. Also jumping rope can help you improve your cardio-pulmonary condition. If you are interested in improving only your aerobic capacity, you could try to jump at a moderate pace until your volitional ability (your will) allows you. Here it is crucial to monitor your heart rate per minute ... so it is important to perform this type of workout with someone who watches your heart rate monitor. You put the band around your chest and the other person will be close to you so that the connection with the watch / pulsemeter is not lost, and so monitor your heart rate ... then you can try to jump by 10,20, 30 o plus non-stop minutes at a moderate pace or with beats per minute between 50% and 60% of your maximum heart rate (HRmax = 220 - age). ie start with moderate jumps for 3 to 5 minutes , then increase the intensity / speed for 2-3 minutes with beats per minute between 70% and 80% of your HRmáx ... then lower the intensity again and stay like this for 2-3 minutes, then increase much more (one jump sprint) to beats per minute greater than 80% of your HRmax and stay as long as you can, and then lower the intensity again ... and so on. The above is simply a basis, since good training should be stipulated by a professional in the sport or Degree in Physical Education, based on your data, measurements and results obtained in certain endurance tests.